The latest leak concerning this 5.5-inch handset that is expected to show up later this week reveals 6 GB RAM, 64 GB internal storage, a Qualcomm Snapdragon 835 processor, a dual-camera setup, as well as Android 7.1 Nougat. On August 17, Asus is expected to unveil a bunch of new ZenFone 4 handsets, including a few ones with high-end features. 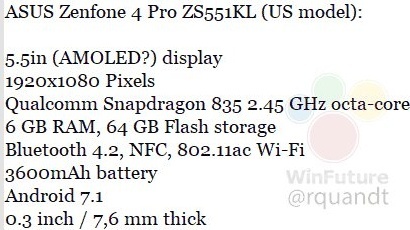 The ZenFone 4 Pro seems to be such a device and, according to Roland Quandt, a model for the US market will be unveiled with a strong set of specs and features. This handset is expected to hit the market for around US$650, but nothing is official yet. We should get all the official details the day after tomorrow, so stay tuned.